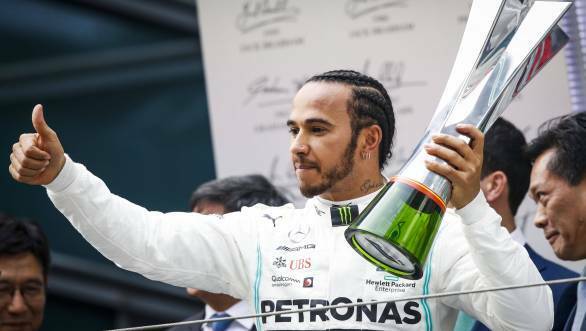 Lewis Hamilton claimed his second Formula 1 win of the 2019 season, with victory at the Chinese Grand Prix. The British driver, who is a five-time Formula 1 champion, has now moved into the lead of the driver's championship standings. Hamilton took the lead of the race at the start, moving past his team-mate and pole man Valtteri Bottas. From then on, he never really faced a threat, managing to take his 75th F1 win. Behind Hamilton, and second-placed Bottas, chaos ensued. This, primarily because all was not well at the Scuderia. Charles Leclerc had managed to pass team-mate Sebastian Vettel on the opening lap of the race. However, since he wasn't quite able to catch the Mercedes drivers, Ferrari issued orders to Leclerc to move over and let Vettel through. Vettel himself had trouble pulling away, something that made Leclerc lose time, and naturally left him rather unhappy. After the first round of pitstops, Vettel ended up over 12 seconds behind Hamilton. 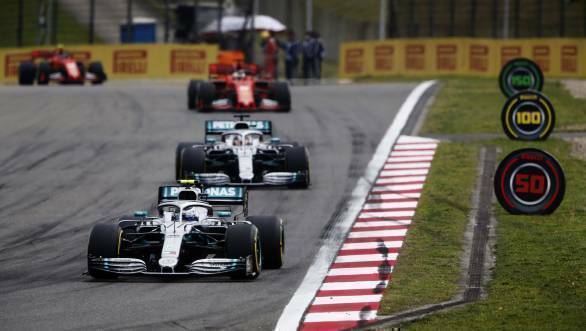 This meant that the Mercedes cars up ahead had some breathing room, while Ferrari's Leclerc was being put on a different strategy to his team-mate, which only further bungled up his race. After his own late pitstop, Leclerc lost fourth place to Red Bull Racing's Max Verstappen. When Mercedes brought Hamilton and Bottas in for the second round of pitstops, they did so executing a perfect pitstop for both drivers on the same lap. The duo then managed to continue at the head of the order, with Hamilton eventually leading Bottas to the chequered flag by five seconds. This gave Mercedes their third one-two finish of the year. Vettel took third place, and his first podium of the 2019 season, while Verstappen finished fourth. Leclerc, unhappily enough, finished fifth. Pierre Gasly had his best finish yet for Red Bull, finishing sixth overall, and coming in for a last minute pitstop that allowed him to set the fastest lap of the race on soft tyres. He also managed to score the bonus point for fastest lap. Behind him, Daniel Ricciardo took his first points for Renault, having managed to end seventh. Racing Point's Sergio Perez finished eighth overall, while Kimi Raikkonen took ninth for Alfa Romeo. The most outstanding driver of the race was Toro Rosso rookie Alexander Albon, who recovered from his pit lane start, and carved his way up the order to end 10th, and claim the last point available. Romain Grosjean finished 11th for Haas F1, while the second Racing Point of Lance Stroll finished 12th. Kevin Magnussen, in the second Haas, finished 13th. Antonio Giovanazzi finished the race 14th in the second Alfa Romeo, ahead of 15th placed Carlos Sainz Jr. in the McLaren. Williams duo George Russell and Robert Kubica were the last of the classified finishers in 16th and 17th places. Daniil Kvyat, Lando Norris and Nico Hulkenberg were the casualties of the race.